Luhansk People’s Republic, Ukraine – Officials of the unrecognized Luhansk People’s Republic threatened Baptist Union pastors not to meet for worship, sending “a clear message that they will not tolerate such meetings for worship any more”. Officials regard all Protestant churches as “illegal”. The 82-year-old independent Baptist pastor Anatoly Tolstenko faces court on 21 March. This news story of the persecution of Protestant Christians in the Russian dominated Luhansk region of Ukraine was first published by Forum 18 News Service in Oslo, Norway. “All Baptist churches that have prayer houses will halt meetings in them, so Sunday worship and other services from 17 March onwards will not take place,” Pastor Bandura added. He said church members fear that if they do not halt their worship, officials could raid their worship meetings or arrest church leaders. 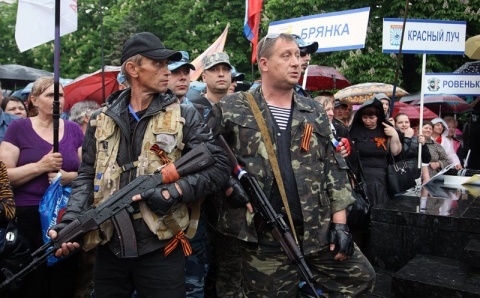 Meanwhile, about ten masked and armed fighters raided a worship meeting in February of Path of Salvation independent Baptist church in the city of Luhansk. The church’s 82-year-old pastor, Anatoly Tolstenko, is due again in court on 21 March accused of leading illegal worship. During a search, the men seized books which the authorities of the unrecognized entity have banned as “extremist”, including Jehovah’s Witness publications. Friends of the community insist the armed fighters planted the books. “These were not their books – the men planted them,” Sergei Kosyak, a Protestant and former resident of Donetsk, told Forum 18. War Room movie: got prayer?